DID YOU KNOW… AYC sends out a ‘Welcome Home Survey’ to each and every one of our charter clients after they return home from their AYC Pacific Northwest Yacht Charter? If you’ve ever had the pleasure of chartering one of our boats, you’ve probably seen the survey sitting in your mailbox when you got home. There are a couple of reasons why we send these surveys out. 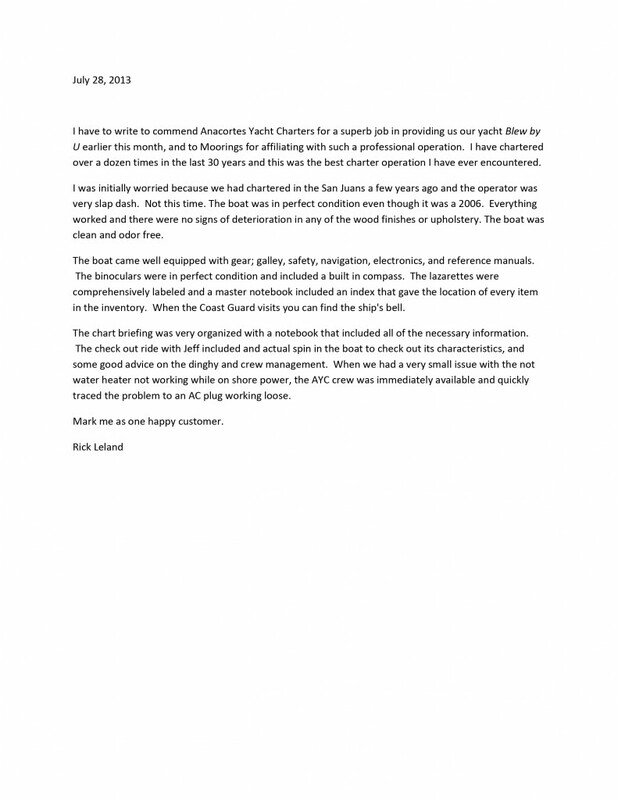 First, it gives us an idea of how the charter went in multiple categories: Overall Summary, Bareboat Yacht Charter (the boat itself), Customer Service, Yacht Crew (if a crewed charter), and then general questions about the experience with AYC and further comments/suggestions. Secondly, the surveys give us an opportunity to address items on the boats that could be repeat issues from a client’s perspective. Items like “There’s little storage in the lazarette, it could be better organized’, ‘great boat, but the navigation equipment needs to be improved’, ‘davit system needs to be improved’, etc. These types also help the boat owner to better outfit their boat by getting a better idea of what the client needs are on his/her charter vessel. That being said, boat owners have an opportunity to review these Welcome Home Surveys at the close of the year at their Post Season Conference. Another important result of the surveys is that it gives AYC a better idea of improvements that need to be made fleet-wide and company-wide. A perfect added years ago were the Customer Lounge complete with coffee, ice cream (a favorite! ), TV, computer and large wall map for itinerary planning. Some great comments from our customers this year and years past can be found all over our website and throughout our facebook page. 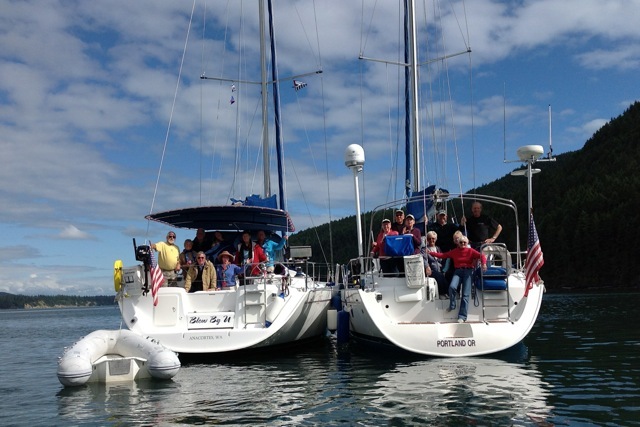 “…When our group arrived in Anacortes on the first day of our charter (as you might imagine, I was trying to control my elation) we, of course, were greeted by all the amazing staff at AYC and then began our pre-cruise briefing which was very helpful and informational (again, this is why you want to charter with AYC – they cover all the bases to make sure you are well prepared). We then had the honor of going through the “on-board” briefing with the owner of Gamapotay. 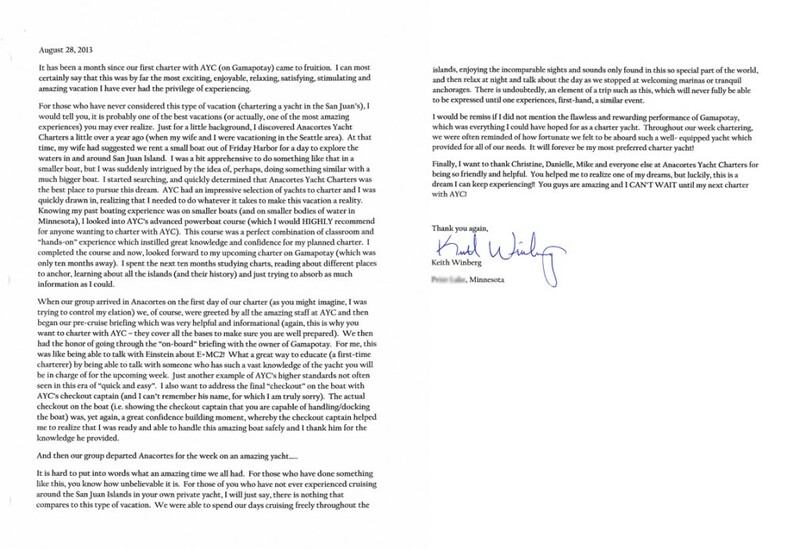 For me, this was like being able to talk with Einstein about E=MC2!…” …click on the image below to read the review in it’s entirety. 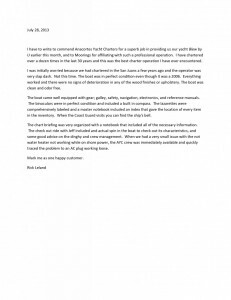 Another awesome review was from Patricia Luttgen who took out two of our sailboats with her group. “As you could see from my resume, I have chartered a lot of boats over the years. I can honestly say I have never had such a wonderful experience with any other chartering company starting with the first phone call of inquiry to the check in at the end of our trip. 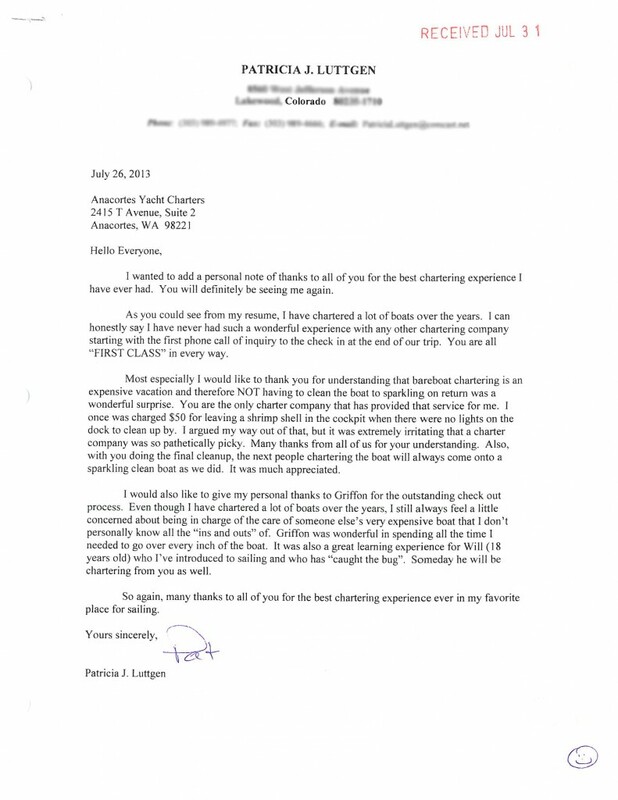 You are all “FIRST CLASS” in every way….” …click on the image to read the review in it’s entirety. And this one from a prior Moorings client, Richard Leland. 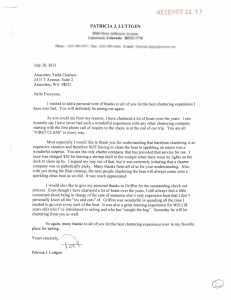 ” I have to write to commend Anacortes Yacht Charters for a superb job in providing us our yacht Blew by U earlier this month, and to Moorings for affiliating with such a professional operation. 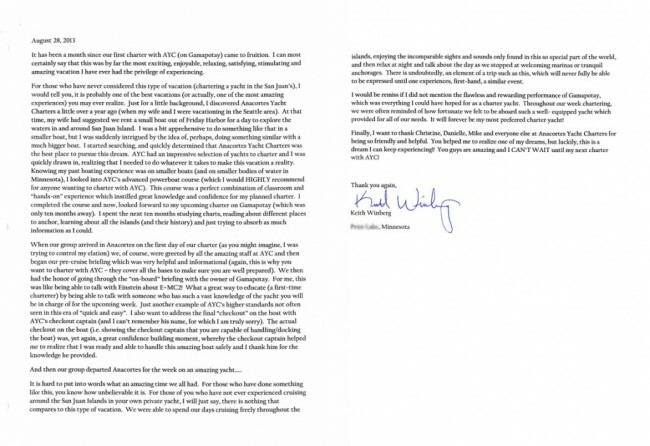 I have chartered over a dozen times in the last 30 years and this was the best charter operation I have ever encountered…” …click on the image to read the review in it’s entirety.